Ok interesting, I'm pretty sure I fixed the inventory persistence bug. The problem was I had used buttons for the icons and set active/inactive images, and apparently those states don't get stored in saves. But the actual value that is checked to see which pendulum the player has was unaffected, it reverted back to 0 (no pendulum) like it should have when the autosave is loaded. So it seems like this is a different issue, I'll see if I can replicate what you are describing tonight and hopefully get it fixed. Thank you so much for all of the feedback! Looks like the buttons are still bugged, I will look into getting them fixed. There was originally a pretty clear differentiation between active and inactive buttons, I have no idea what happened, but I'll add that to the bug list. Due to the way the engine works I unfortunately can't make the dialogue continue, but I'll mess with the timing to see if I can get everything to fit! That was a silly oversight on my part, I had everything timed properly but did something to set it off. I'll be working on a separate pause menu to replace the current one as well, one that will actually pause the game. That's another thing I forgot to add to my to do list, so thank you for pointing it out! The way pausing the game works in the new engine I'm using is different from the old one. The inventory is not supposed to persist, I'll add that to the bug list as well. I thought I had that sorted out, it's really strange because the game autosaves before you even pick up anything, and that autosave is the return point when clicking "continue". I'll see what I can do to fix it! I'll work on adding some proper indicators for what the powers do, thank you for pointing that out! I have a question for you, did you choose the same pendulum both times? I have a feeling the persisting inventory may have caused an issue, each pendulum does do something different, and there are different ways to traverse the puzzle room depending on which one you have. Purple is the only one that allows teleportation, and you shouldn't have been able to get through the door if you had the purple one. From what you said, it sounds like you were able to get through the door with it? itch.io Community » Creativity & Art » 2D Art · Replied to HelixAbyss in Whatcha Working On? Hope it's ok that I'm posting here again, I'm really happy with how this image is turning out. 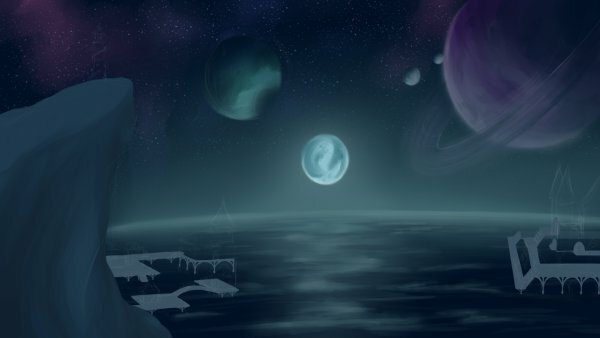 I've never been that great at drawing bodies of water or starry skies, so I'm pretty proud of this one! 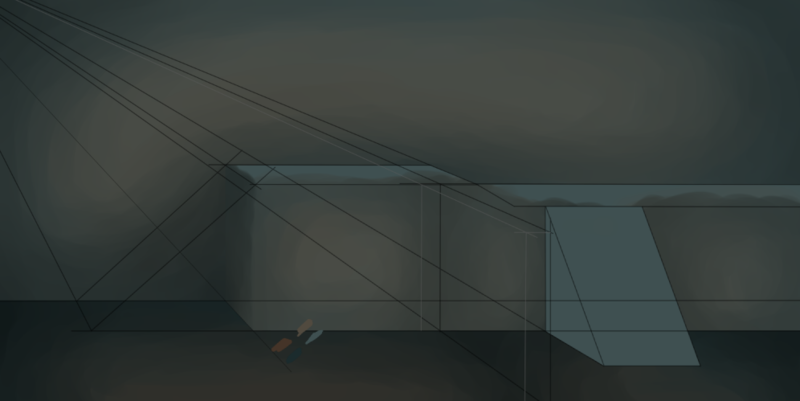 I'm working on a background for one of the scenes in my game. It's the last background I need to make for this section of the game, so I'm pretty excited! It's also a bit of a weird one since it's going to have some puzzle elements that have various ways of solving depending on a choice made earlier in the game. - Added some ability icons to show what objects will be affected by abilities! - Faeth no longer disappears if you hold a run button while she is standing still and talking. - Active and Inactive buttons on the title screen now have visual differentiation. - Added some extra logic to ensure that Faeth is in the right place at the final cutscene. - Faeth will not longer disappear after walking up the stairs in the puzzle room with the pink pendulum. - Inventory will no longer persist upon continuing. The items weren't actually there, they just appeared to be. Some weird stuff with active/inactive state of buttons not being part of saves. - Updated attack and defend animations, they now have a decorative animation related to the pendulum that you choose. - New scene, the puzzle room! There are six different ways to traverse depending on which pendulum you choose. - New voice files, animation set, and song/musical cue for the new room! - Redesign for the silhouette monsters, I created completely new models and animated them all by hand. I think the new design matches the art theme much better! - Minor changes to Faeth's walk animations to make them less stiff. - A bit of the intro for the game, just enough to hopefully make things less confusing! - Increased the volume for voices as I received feedback that they were too quiet for users not using headphones. If you don't mind, what in particular about the mechanics was odd (so I can hopefully clarify things so they make more sense)? I am currently working on getting keyboard control setup, hopefully it won't be much longer but I'm having some issues as, luck would have it. The game should play much more nicely after that though since the scenes were designed to be navigated with the keyboard. You are welcome to leave feedback on the game's demo here! Let me know what you thought, if there's anything you think should be changed, or if there's anything you really liked. You can also let me know of any bugs you found here as well. itch.io Community » General » General Discussion · Replied to slimefriend in Pitch your game: "One line to lure them all"! Ellapse is a journey through a surreal, dream-like world where decisions have noticeable impacts and the line between close friends and enemies is hard to find. How was that? It's kind of hard to summarize a game in one line (especially one you've been planning and working on for over a year), this is good practice! Hey there, I'm Helix! I'm currently working on my first game called Ellapse. I've been creating art since I was really young and have always been interested in animation. I am also majoring in Computer Science, currently in my third year of college. Now that I have delved into the world of game creation it feels like all of these random hobbies of mine actually have a way of coming together into one big project! I just discovered this forum today and will probably be posting all over the place once I finish my probability and statistics homework, haha!